Posted editorial from The Courier Journal. That Louisville is home to one of Olmsted's greatest park systems is nationally recognized. Indeed, the city can boast that it has his final master work, which has stood the test of time well-preserved. However, very few Louisvillians know that when Olmsted first came to Louisville in 1890, his original plan for the city delivered in September 1891 included the design of two street parks which no longer exist — Logan Place in the 16th block of West Market Street and Kenton Place in the 800 Block of East Market. In 1983 the entire neighborhood of Phoenix Hill was designated as a National Register Historic District, and recently the nineteenth-century buildings in the 800 block of East Market (once known as Wayside) have been designated as landmarks. We believe it is time for Kenton Place to be restored as part of the national heritage and a missing monument to one of America's masters. 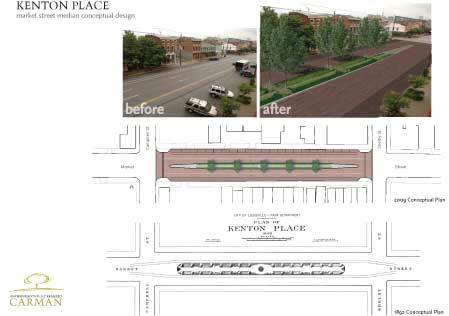 Kenton Place was a short-lived green space. It was built and dedicated in 1892 and destroyed in 1900 to make way for the streetcar. Emil Mahlo, the local parks engineer at the time, was key in implementing Olmsted's designs. He worked closely with the Olmsted firm to make sure its plans matched the complex topography. The Bingham Fellows is Leadership Louisville's community action program. This year its charge was to figure out ways to make Louisville a more attractive place for young professionals to move to and to stay (the retention factor). The Fellows chose three categories where we thought we could make a difference: One group is creating a Mayor's Kitchen Cabinet of young professionals around the city (to encourage a sense of involvement with local government initiatives and projects). Another group is working on helping interns connect to each other across businesses and with the community at large (a great way to attract and retain young talent). Our third group decided that quality of life and green spaces were a magnet for the “20-somethings” whom cities want to attract and retain. So Kenton Place is our mission: a small park in a bustling arts neighborhood and a “breathing place” that not only connects downtown to Cherokee Park as Olmsted originally intended but also helps keep us connected with nature in the urban downtown. Everyone who has photographs of this park, please send them to us at Bingham Fellows / Leadership Louisville! We would like to post photographs along with the original drawings in our presentational booth at the First Annual Nulu East Market Festival on Sept. 26 from 5-11 p.m. Please come visit our booth and learn more about Olmsted's Kenton Place and how you can help restore Louisville's long-lost Olmsted park!